Fink’s Paving, Excavating and Concrete is the experienced concrete flatwork contractor in Madison, WI. We offer residential and commercial driveways, sidewalks, patios, foundations, garage floors, farm work, and other concrete services listed below. We know concrete. Our staff works directly with you to create the perfect driveway, foundation, sidewalk, patio, or other concrete flatwork. If you’re looking for concrete flatwork you’ve come to the right place. 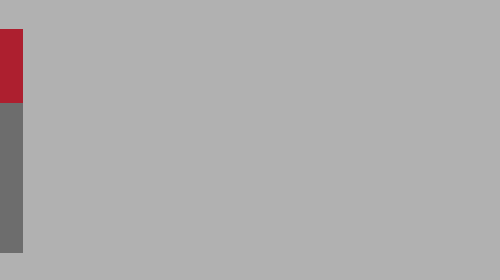 Fink’s Paving, Excavating and concrete is (Madison’s) Dane County’s concrete specialist. We specialize in interior and exterior concrete work such as residential driveway replacement and new construction driveways, commercial concrete installation, sidewalks, basements, garage floors, patios and more. Our concrete team is prepared for nearly every situation. As a professional concrete contractor, we control the entire project internally from start to finish, so the work will get done quickly and with consistent quality. With customer satisfaction as our top priority, you can expect high quality products and services every time. No job is too large or small for our experienced flatwork team. We will go that extra mile to ensure your custom project is completed on time and within budget. Whether you need concrete floor finishing, foundations, or a stamped concrete walkway, you can depend on our expert team at Fink’s Paving, Excavating & Concrete in Mount Horeb, WI. Serving Madison and surrounding areas, we are diversified to accommodate all types of jobs. When it comes time to replace your existing driveway or turnaround, we can help. We’ll evaluate the existing conditions and develop a plan to remove and replace your current driveway. Unlike asphalt, concrete can’t be installed as a thin overlay. Our plan includes removing the existing concrete or asphalt driveway followed by grading of an appropriate base. We’ll install forms and supports and pour new concrete. Our team pays special attention to drainage and finish. We know you’ll love a new driveway from Fink’s – a driveway for Your lifetime! Give your new home the ultimate first impression with a turnkey concrete driveway from Fink’s Paving, Excavating & Concrete. 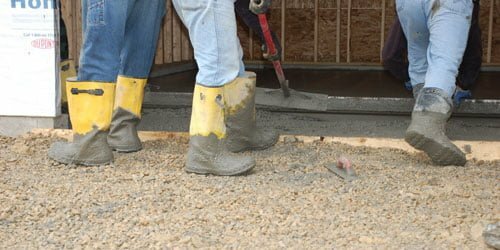 We have the ability to grade, install the base and pour and float the concrete for your new driveway. Our concrete work is controlled by our internal team and we make sure we’re providing the right product for your application. Once we complete your concrete driveway, you can expect your new driveway to last for a generation. Whether pouring a new foundation or finishing an existing basement floor, we can help. Our team will grade the existing space and install forms as needed. 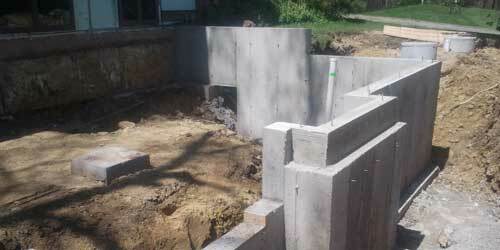 We will deliver the concrete to the basements area and proceed with finish and flatwork. You’ll be glad you finally got around to getting the floor your basement deserves. In older homes, the existing garage floor may develop a maze of cracks and separations. 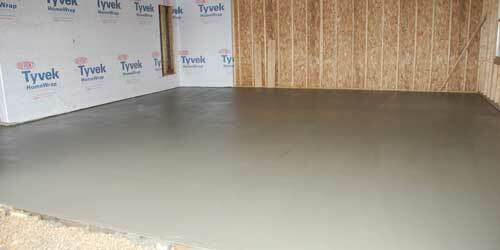 We can come in and remove the existing garage floor and re-grade and install a new concrete garage floor. The whole process works well when we are also replacing the driveway, but that isn’t required to replace your garage floor with a new floor from Fink’s. If you’d like to add additional parking or a carport next to your garage, we can get the pad set for you and blend it with your existing driveway infrastructure. If you are looking to add a shed or outbuilding to your property, we can set up the base. We will grade and fill with a new base and then pour a concrete slab to fit your new structure. We understand farm layouts and processes. 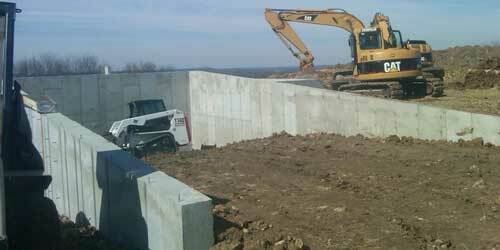 Our team will assess your existing site conditions and create a plan to meet your farm’s new concrete needs. Whether it’s a livestock area, a barn floor, or an equipment pad, we’ve got you covered. Fink’s is also a residential and commercial expert in sidewalk, steps, and front stoop installation or replacement. The process is quite similar to a new construction or replacement driveway, but with a narrower path or finished space. However, the quality and curb appeal that a new concrete sidewalk or steps add to a business or a home is undeniable. Exterior concrete patios are a superb choice for a backyard patio. Unlike a paver or brick patio, poured concrete patios don’t have a gaps that allow plants, debris, or heaving to ruin a near-new patio. We even offer stamped or colored concrete in certain patio applications. 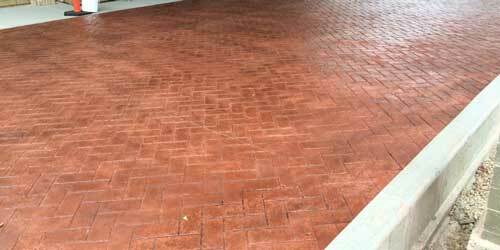 In addition to smooth floated and broom finished concrete, we offer stamped and colored specialty concrete. 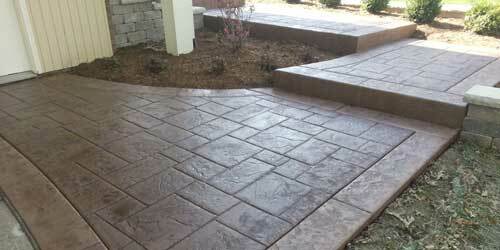 Stamped concrete is an excellent choice for a backyard concrete patio or a walkway to the front door. Our team can walk you through options and you can select a patterned concrete patio for finish that meets your needs. Are you a Builder looking for contractor solutions?